chameleon exploits our shared memories, our relationship with the landscape and our capacity for play. 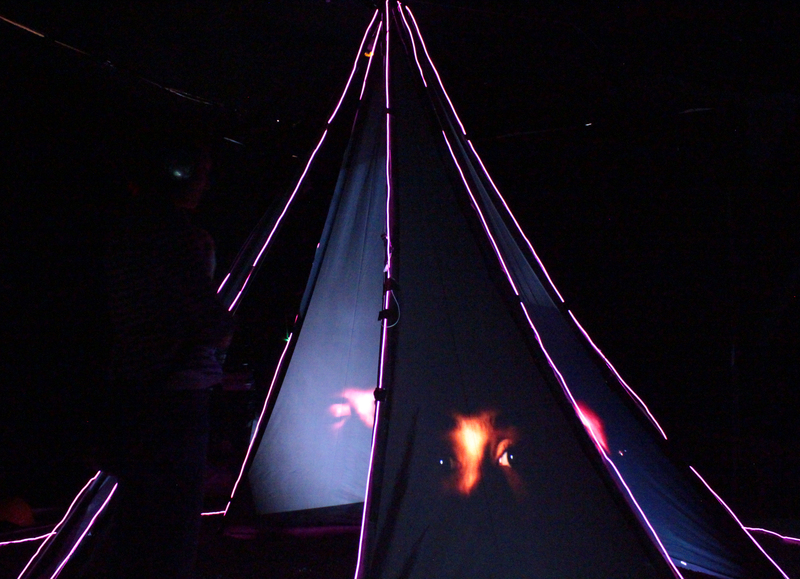 It invites pairs of visitors to venture into a mysterious structure with ancient resonances: when they do so, their environment responds by unleashing a wonderland of hypnagogic sensations, which they can explore freely together – only gradually discovering the extent of their influence over their surroundings, and thus their power over each other. 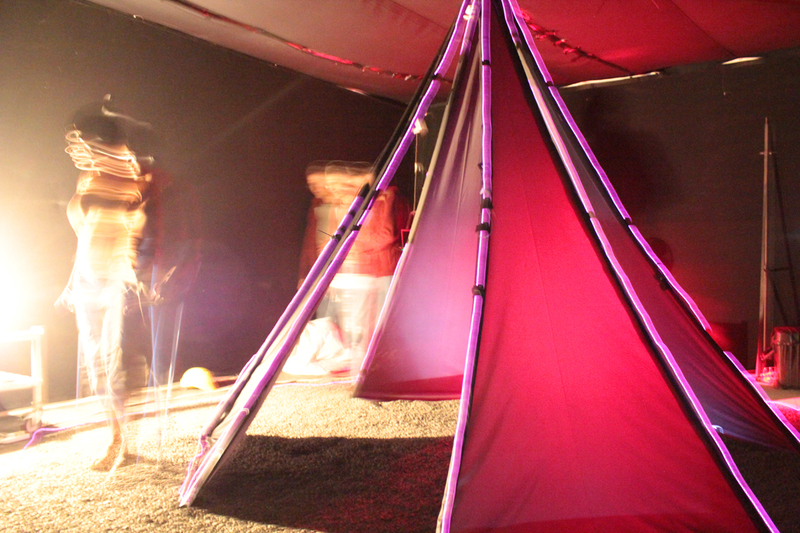 The installation features a black-out space with damp gravel floor and multiple front/rear- projection sails meeting to form a “tent” (with pathways illuminated by electroluminescent string). 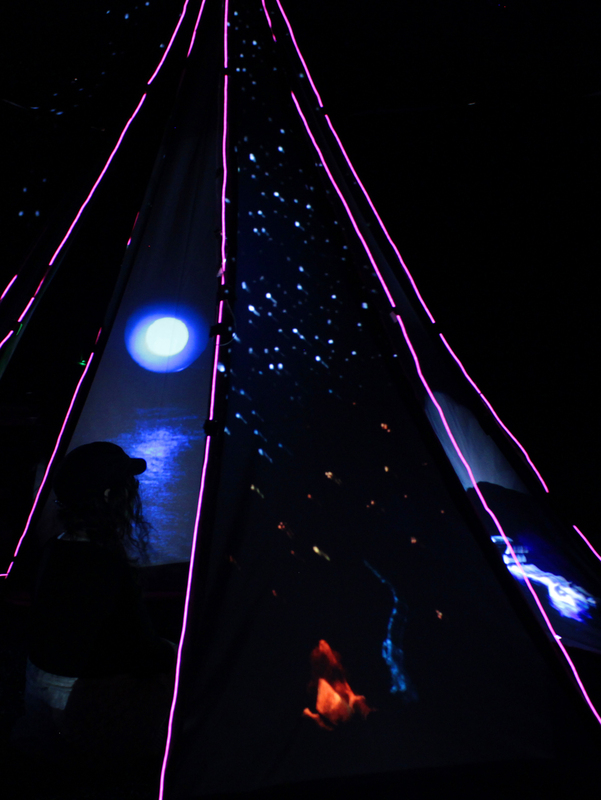 Each entrance into the tent triggers its own unique sensory landscape instantaneously, like a portal in a computer game, leading to imaginary universes created with surround projections, binaural soundscapes, lights, scent, wind and water effects. The effects are triggered using sensors and a bespoke mains relay system I developed with Jonathan Green. Guests aren’t told how it works: the fun lies in discovering and exploring their relationship with a pliable environment. You have to think about it. You’re involved in it. You are the artwork. Fantastic! Played on my senses. At first I thought it was going to be a scary experience, but it was more of a spiritual experience… and I wanted to play, going in and out of each entrance and determining which sounds will be played when I walk through it. Definitely enjoyed this work! FANTASTIC!! I was so overwhelmed that I was reduced to tears. I found the experience fascinating… Changing over the music/sounds was brilliant. The accompanying visual effects on the structure in the middle was brilliant. I felt that I had been transported to the beach. Amazing, fantastic, etc.